In Burma, USAID’s Land Tenure Project (LTP) and the Farmers Labor Union (FLU), a local civil society organization, presented community resource documentation to community members of Let Maung Kway Village Tract in southern Shan State. To mark the completion of mapping and resource documentation activities, LTP hosted a multi-stakeholder dialogue that invited community members and local and state authorities to review the community-produced maps documenting village tract boundaries and land use. The State Minister for the Ministry of Agriculture, Livestock and Irrigation presented opening remarks and the local Forest Depart Officer provided an update on the area’s strategic plan. This event marks the culmination of LTP’s work in the village tract, where activities commenced in late 2016. Through an LTP-supported local civil society organization, the project helped boost the understanding of the National Land Use Policy within the participating communities. The project also led community members through a series of mapping activities, helping them to examine and identify their village boundaries and land use. With the knowledge of the land policy and the documentation from mapping activities, local communities will be empowered when land issues arise. 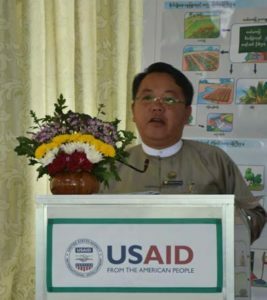 The project also promoted engagement and dialogue between community members and government officials, something historically rare in Burma, which benefits all stakeholders.